Thomas Jefferson's garden at Monticello served as an experimental laboratory for garden vegetables from around the world. 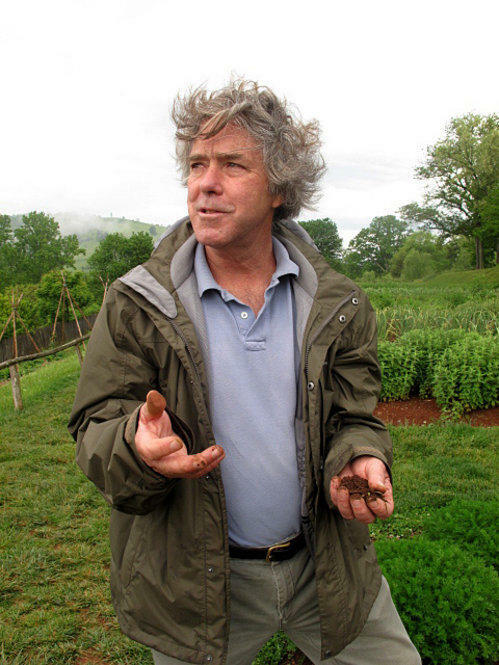 Peter Hatch has been Monticello's director of gardens and grounds since 1977. When he first came to the estate, this garden didn't exist: Forty percent of it was a parking lot for tourists; the rest was planted with flowers. It took years of careful archaeological work and research to reconstruct the garden according to Jefferson's design. Over his lifetime, Jefferson grew 330 varieties of 99 species of vegetables and herbs. 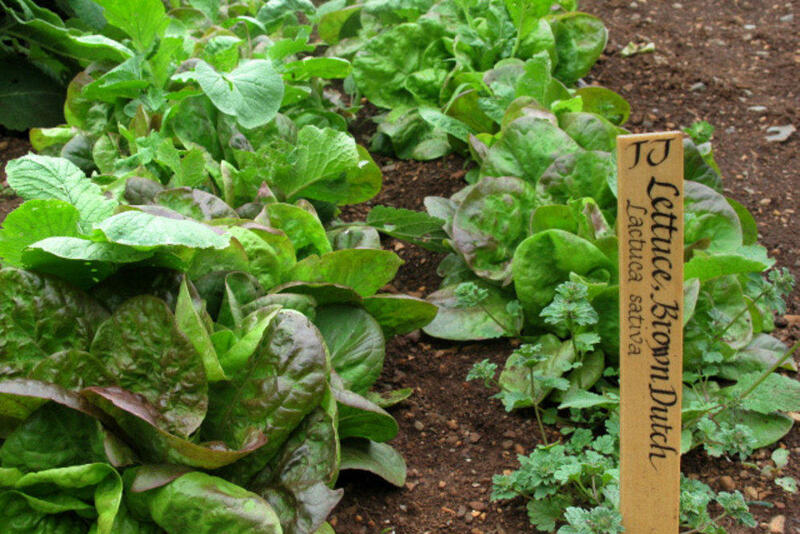 Brown Dutch lettuce was a Jefferson favorite: He'd sow it in the fall to harvest through the winter months. 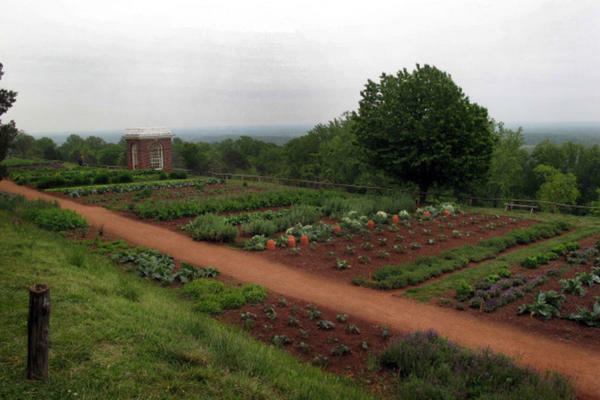 The vegetable garden at Monticello acts as a seed bank to preserve the heirloom varieties of vegetables that Jefferson grew. Seeds are collected, cleaned and packaged for sale. 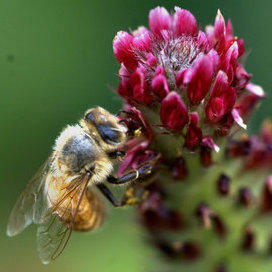 A bee does its work in a thick bed of crimson clover. Jefferson experimented with clover in his fields after returning from France. Peas were Jefferson's favorite vegetable. He grew 24 varieties, devoting an uncommon amount of garden real estate to them. Marrowfat peas — staked here with alder branches — are a late-season variety, best for drying. 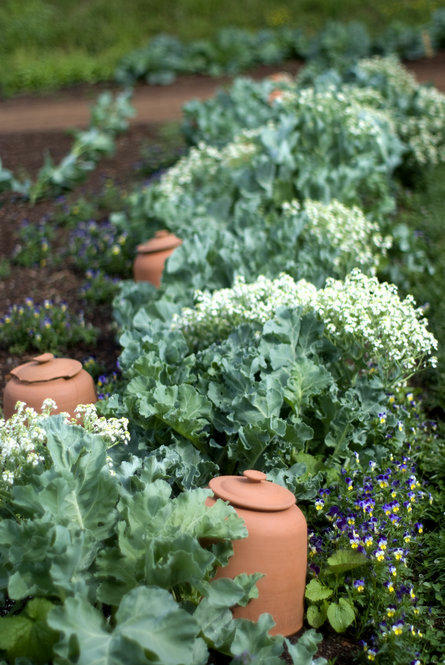 Sea kale is a perennial cabbagelike plant that grows wild on the seacoast of Great Britain. 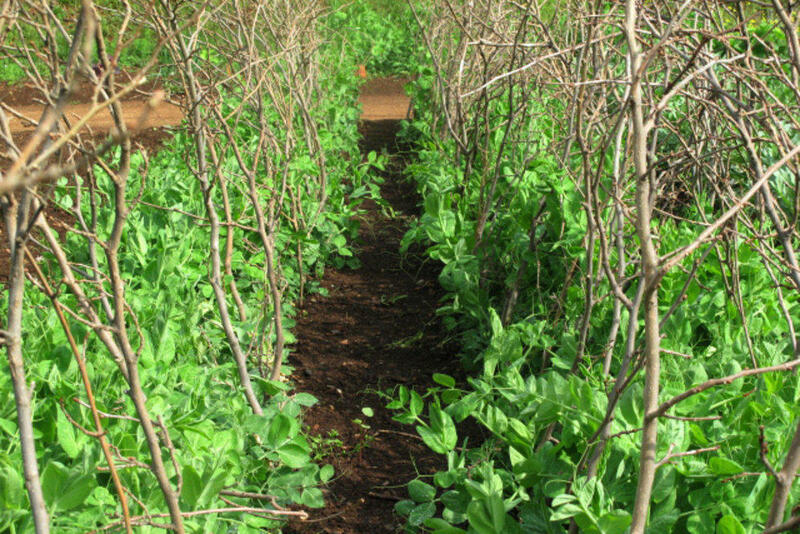 In the wild, shoots are covered by shifting sands, which prevents the production of chlorophyll and keeps the leaves white and more tender. 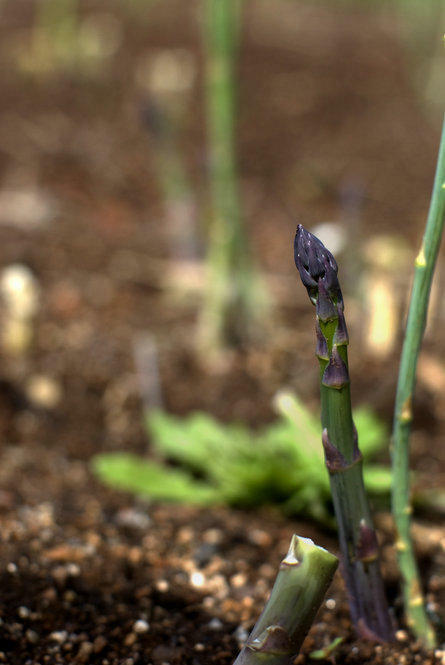 Asparagus was a prime part of Jefferson's garden and received "uncommon attention," according to Hatch. Jefferson took pride in documenting when his asparagus first pushed through the ground and first came to the table. After Jefferson left the presidency, he planted a retirement garden at Monticello that is 300 yards long and supported by a stone wall 12 feet high in places. It looks out over the rolling Virginia Piedmont. 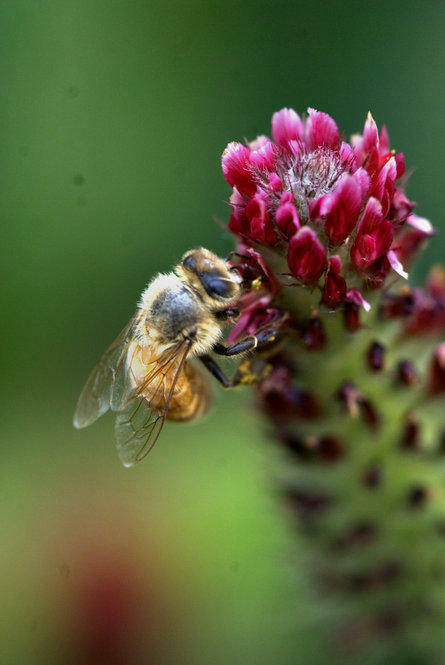 A bee buzzes the crimson clover at Monticello. After Jefferson retired from public life to his beloved Virginia hilltop plantation, the garden "served as a sort of this experimental testing lab where he'd try new vegetables he sought out from around the globe," says Peter Hatch, the estate's head gardener. Hatch recently wrote a book about Jefferson's garden and its history called A Rich Spot of Earth. Somehow, the author of the Declaration of Independence and the nation's third president found spare time to meticulously document his many trials and errors, growing over 300 varieties of more than 90 different plants. These included exotics like sesame, chickpeas, sea kale and salsify. They're more commonly available now, but were rare for the region at the time. So were tomatoes and eggplant. All the time, he carefully documented planting procedures, spacings of rows, when blossoms appeared, and when the food should come to the table. Behind Jefferson's "zeal to categorize the world around him" was a patriotic mission, Hatch says. Jefferson wrote, "The greatest service which can be rendered any country is to add a useful plant to its culture." Hatch says, "He believed that plants could transform society." Jefferson even mused that the slavery of African-Americans in the Deep South might be replaced if sugar maple trees could replace sugar cane. He said they'd be so simple to tend, children could do it. Despite those words, Jefferson used slave labor to construct the garden and worked there daily with his enslaved African-American Wormley Hughes, the same man who later dug Jefferson's grave. Lots of things failed in the garden. His entries from 1809 show the carrots, beets, sorrel and okra, the cauliflower, tarragon and Chinese melons missing the mark. Jefferson cites Windsor Beans as "killed by bug" and notes on Aug. 21: "From the 7th of Apr. to this day, excessive drought and cold. Now a good rain." Hatch gives some hope to home gardeners who might want to experiment themselves. "The use of the word 'failed' is repeated throughout [Jefferson's] garden book, and one wonders if any gardener has written about failure as much as Thomas Jefferson. He once also wrote that if he failed 99 times out of 100, that one success was worth the 99 failures," Hatch says. These days, some of the Jefferson garden bounty is sold to the cafe at Monticello, some goes home with employees, and many plants in the garden are allowed to go to seed. 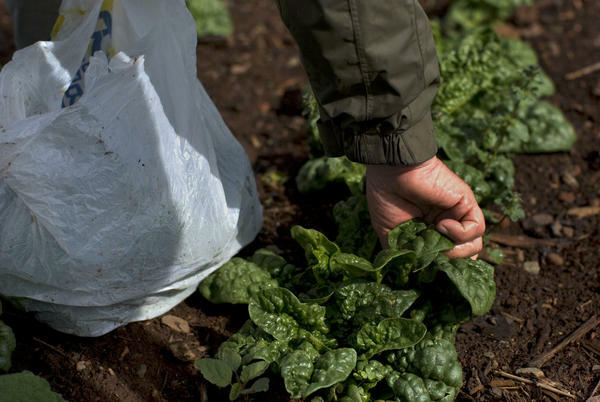 Hatch says Jefferson's once-pioneering garden now acts as a seed bank to perpetuate rare lines and varieties like Prickly-seeded Spinach and Dutch Brown lettuce, all for sale at the gift shop. Despite the diversity of vegetables Jefferson's garden produced, the recipes unearthed by scholars and attributed to his family were quite typical for the day: Boil everything. Some of the recipes survived and were reprinted in The Congressional Cook Book (1933). If you're looking for instructions for Colonial American-style Cabbage Pudding and Dried Beans, check this out. They're hard to make out, but here are some written in Jefferson's own hand. It's ALL THINGS CONSIDERED from NPR News. I'm Audie. And I'm Melissa Block, on a visit today to a garden of wonder. UNIDENTIFIED CHILD: Oh, my gosh. What are these? BLOCK: A garden with surprises everywhere you look. UNIDENTIFIED WOMAN: Marshmallow. Look at this. I don't know how that works. BLOCK: Tall, leafy marshmallow. Feathery tansy. Hyssop and feverfew. Salsify. Marrowfat peas. Arikara beans, the seed brought back by Lewis and Clark. We're in Thomas Jefferson's vegetable garden, high up at Monticello in Charlottesville, Virginia. A long, lush ribbon of every shade of green you can imagine. PETER HATCH: This is a thousand foot long terrace. BLOCK: Our guide is Monticello's director of gardens and grounds, Peter Hatch. HATCH: One person referred to it as a hanging garden because of its plateau, and it's carved out of the southeastern hillside of Monticello Mountain. BLOCK: So a thousand feet long. BLOCK: Thomas Jefferson - our brainy third president, author of the Declaration of Independence, diplomat, architect, inventor, polymath - was also a vegetable nut. He wrote in a letter: I have lived temperately, eating little animal food, and that as a condiment for the vegetable, which constitute my principal diet. And over his lifetime, Jefferson grew an astounding number of them: 330 varieties of 99 species. Peter Hatch, with a wild shock of graying hair, shows us around the garden which he calls an Ellis Island of new and unusual plants from all over the world. What do we have on our right, Peter? HATCH: We have some, I guess one of Jefferson's favorite lettuce varieties, called a tennis ball. BLOCK: It's a really beautiful sort of tight, crunchy looking head. HATCH: Yeah, it's a kind of predecessor of Boston types that people enjoy today. It's got a lighter green leaf. Jefferson loved lettuce. He documented harvesting it every month of the year. BLOCK: Every month of the year? HATCH: Yeah. And sometimes in the summertime our lettuce gets a little bitter. But lettuce was commonly boiled like spinach, as a dressed green. 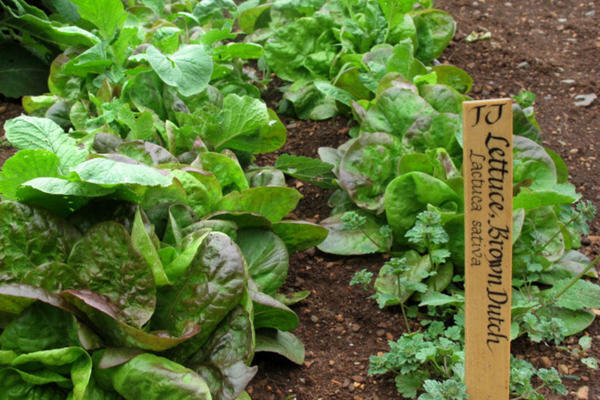 BLOCK: In a neighboring bed, Peter Hatch points out rosettes of brown Dutch lettuce. HATCH: ...sort of it's a basket of vegetable bliss is sticking your head in a bowl of brown Dutch lettuce. BLOCK: Peter Hatch has worked at Monticello for 35 years now. When he started, this vegetable garden didn't even exist. Much of it was a parking lot. HATCH: You know, 40 percent of the garden was asphalt. BLOCK: And the rest was planted with flowers. The staff spent years doing archeological research, consulting Jefferson's detailed notes and drawings, to restore the garden to his original design. As for the vegetables, some of what Jefferson planted remains a mystery, but the gardeners here have found and planted many of Jefferson's heirloom varieties, to recreate his garden as best they can. HATCH: And we have some peas up here and peas are often regarded as Jefferson's favorite vegetable. He grew some 24 different varieties. Jefferson also had contests with his neighbors to see who could bring the first English pea to table in the springtime. BLOCK: What was it about peas that Jefferson's loved so much? HATCH: Well, they're sort of a harbinger of springtime. They're the first kind of fruity thing that come out of the garden. They're sweet. They're fun to grow. I mean, they grow fast. They have this lush green foliage to them. They have pretty flowers. BLOCK: I see artichokes in the next bed? HATCH: The globe artichoke was a favorite of Jefferson. Artichokes were sort of a gentleman's fruit in the early 1800s. The wealthiest Virginians grew them as sort of a confirmation and affirmation of their place in the world. BLOCK: We've been walking through the garden Thomas Jefferson designed for his retirement. After his two terms as president, at the age of 65, he returned home from Washington, thrilled to be back at Monticello. HATCH: Jefferson wrote: I am constantly in my garden or farms. And I find myself infinitely happier in my new mode of life. BLOCK: Do you think that's true? HATCH: Yeah, I think Jefferson looked to retirement at Monticello as this great relief from the slings and the arrows of political life. Even as Jefferson was anticipating his retirement, it was this garden, this vegetable garden that he really wanted to have completed for his arrival here in March of 1809. BLOCK: It's really impossible to look at this garden and imagine what it took to construct it, without thinking about the slaves that built this. HATCH: Right. Jefferson wrote that slavery was an abominable crime but he was a lifelong slaveholder. They moved the dirt to create this terrace with a mule and a cart - some 300,000 cubic feet of earth. BLOCK: All supported by a retaining wall of stone they had to build, 12-feet high in places. All his life, Jefferson would collect seeds wherever he went. He brought seeds back from France, where he was minister. BLOCK: Maybe the bees we hear buzzing today in the French lavender blossoms are enjoying a treat he found there. When Jefferson sent Lewis and Clark out West, part of their mission was to bring back seeds from the Indian tribes. He would collect seeds and then share them with his friends. HATCH: You know, he played this role of being almost a seedy missionary. HATCH: This evangelical quest to pass out his favorite vegetables. Jefferson spent a lot more time in the garden than he did in the kitchen. And that's reflected by the fact that most vegetables, when he'd send them to people, he'd tell everybody, well, just make it - prepare it like you would asparagus. HATCH: Suggesting his knowledge of gardening exceeded perhaps his knowledge of cooking. BLOCK: Now, the Monticello gardeners let many of the plants here go to seed. They collect the seed and package it for sale to help preserve these historic varieties. And variety was key. Peter Hatch says Jefferson figured out how to turn Virginia's intensely hot summers to his favor. HATCH: What he did that was really kind of revolutionary was he assembled this collection of things we take for granted today, from tomatoes to eggplants to okra to peppers. From lima beans to sweet potatoes. From peanuts to Crowder peas. And he adapted this garden to really take advantage of this crop-ripening sunshine to grow things throughout the summer months. That was really kind of unusual. BLOCK: And no detail was too small for Jefferson to document in brown ink, in the garden book he carefully kept for nearly 60 years. The number of peas it took to fill a pint jar: 2,500. The day his first spear of asparagus pushed through the ground in 1794: March 27th. You can imagine Thomas Jefferson at the end of his life, here in his Monticello garden, maybe bending down to sprinkle the thimbleful of lettuce that he said should be sowed every Monday morning, from February 1st to September 1st. Gardening, says Peter Hatch, was Jefferson's defiance of age. HATCH: For Jefferson's to come out into this garden was sort of an affirmation of his vigor in so many different ways. And even at the age of 83, Jefferson read about giant cucumbers in a Cleveland, Ohio newspaper. And he wrote to the governor of Ohio and asked him for seeds of this cucumber, and passed them around to his friends in Charlottesville; grew them in his garden; typically measured how long each one was that came out of his garden. And Jefferson once wrote that although I'm an old man, I am but a young gardener. BLOCK: Peter Hatch, director of Gardens and Grounds at Monticello. 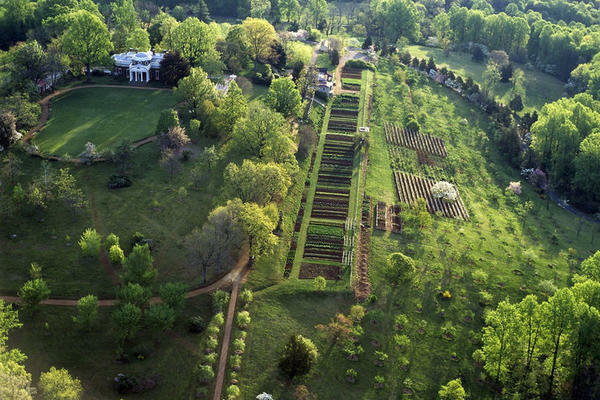 He's just published a new book about Jefferson's garden and its history, titled "A Rich Spot of Earth: Thomas Jefferson's Revolutionary Garden at Monticello." You can find an excerpt of the book, also a slideshow of our trip to the garden, and links to some Jefferson family recipes. That's on our food blog, The Salt, at NPR.org. CORNISH: And speaking of recipes, a reminder about our lost recipe project. If you're having trouble recreating a family recipe, either it's not working or you've never had it to start with, write us. Just go to NPR.org and click on Contact Us. Remember to put Lost Recipe in the subject line, along with a bit about the original cook. We've lined up some kitchen detectives to help you get that family favorite back on the table. Transcript provided by NPR, Copyright NPR.